Fierljeppen. 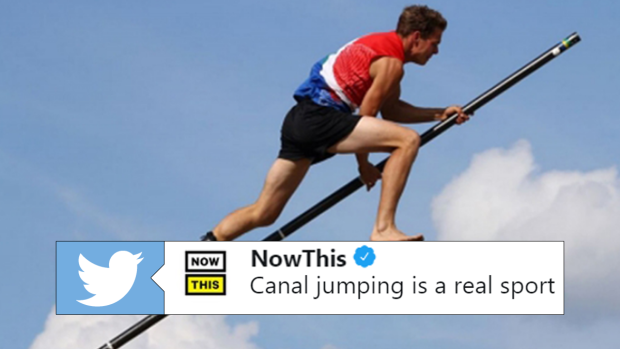 That is the traditional name of a Dutch sport that North American’s may call canal vaulting or ditch jumping. It is a really old sport, and a very intense one that has surely resulted in more than a few injuries. The idea is simple; get to the other side of the canal. The one device you have to get there is a very, very large pole (26 to 43 feet tall). The sport’s first official match happened in 1771, and it has developed into the high-flying, hard-falling vault show it is today. Apparently it originated from farmers simply trying to leap over small water drainage channels. How cool is that? That’s a lot to process in one sitting. First of all, why do the coaches follow the competitor down the catwalk before they take off? Are they acting as a hype man? Is it to simulate them being chased, and therefore motivating them to “get away” faster? Next, how do they not consistently suffer sprained ankles or other injuries from the fall? Even though there’s sand on the other side, it’s hard to land with such a heavy impact, especially when you consider they don’t have much time to prepare for landing. Lastly, where can we watch this live? Oh God. I love the Dutch. Lol. Why do two ppl run after the jumper?!? Alexa, what's the quickest and scariest way to brake my ankle?